Kim and I represented Hugger at the annual Labor Day Cargo Bike Ride. That is where we spotted this custom painted beauty. 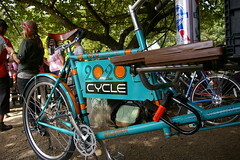 Alex, head mechanic and owner of 20/20 had this frame fashioned by Bilenky Cycle Works in Philly PA. Inspired to get your own? We expect two similar Bilenky Cargo Bikes are in the works. They’ll be available for sale at 20/20 upon completion. More photos from the cargo bike social to come. Uploaded by Dapper Lad Cycles | more from the Bike Hugger Photostream. Previous Previous post: Hey Ladies!